Chela is a sweet girl, looking for her forever home. 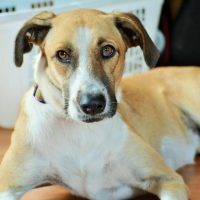 She loves to run and play and would be best with an active family – lots of walks, hikes, family outings. While she does like a great romp in her yard (fully fenced), she also loves her cuddle time. She gets along with dogs, cats, kids. At just 44 lbs, she’s a good size – not too big, not too small!